The advent of the national road system in 1926 ushered in a golden age for mom-and-pop entrepreneurs. For Henry Soulsby of Mount Olive, it happened just in time. Mr. Soulsby followed his father, an Irish immigrant, into mining, but in the mid-1920s an injury forced him aboveground. Understanding that a national highway would soon pass through Mount Olive, he invested most of his life savings in two lots at the corner of 1st Street, now called Old Route 66. With the balance he built a gas station. The Soulsby Station is an excellent example of a house with canopy form. 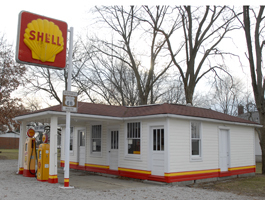 By the time Mr. Soulsby built his station in 1926, the leading oil companies had been hiring architects to design stations that would blend well with neighborhoods to minimize local opposition to the crudeness often associated with gas stations. Mr. Soulsby designed the building himself, taking into account these trends and blending well with the surrounding area. When Henry Soulsby retired, his children Russell and Ola Soulsby took over the station, a partnership that would endure until Ola’s death in 1996. Each was as adept as the other at pumping gas, checking the oil, and looking under the hood or chassis to detect and fix problems. Russell always had an eye for technology. During World War II, he was a communications technician in the Pacific theater. Shortly after coming home, he turned his experience into a second, simultaneous career--radio and television repair. He used an antenna on the roof of the station to test his work. Route 66 was a great agent of progress and development, but its very success helped spell its doom. In the late 1950s, Interstate 55 began supplanting it in Illinois. In Mount Olive, the Soulsby Station ended up a mile away from the new thoroughfare. In 1991, the Soulsby Station stopped pumping gas but continued to check oil, sell soda pop, and greet the ever-growing legion of Route 66 tourists. Sending everyone off with a wink and a wave, Russell and Ola closed the doors for good in 1993 and sold the station in 1997 to a neighbor, Mike Dragovich. When Russell Soulsby died in 1999, his funeral procession took him under the canopy one last time. This time it was his friends’ turn to wink and wave. The current owner, Mr. Dragovich, and the Soulsby Preservation Society began preservation efforts in 2003, removing vinyl siding, restoring the original doors and windows, and repainting the exterior. In 2004, the National Park Service provided grant support for restoration efforts. Today, the station looks essentially the same as it did during its post-World War II heyday. It was listed in the National Register of Historic Places in 2004. 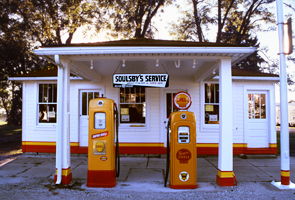 The Soulsby Service Station is located on the southwest corner of First St. and Old Route 66 at 710 West First St. in Mount Olive, IL. Plans are underway to open the station as a museum. The station's National Register nomination form can be found here.